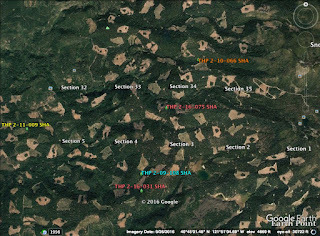 Roseburg Resources Company to clearcut log near Dunsmuir, CA. 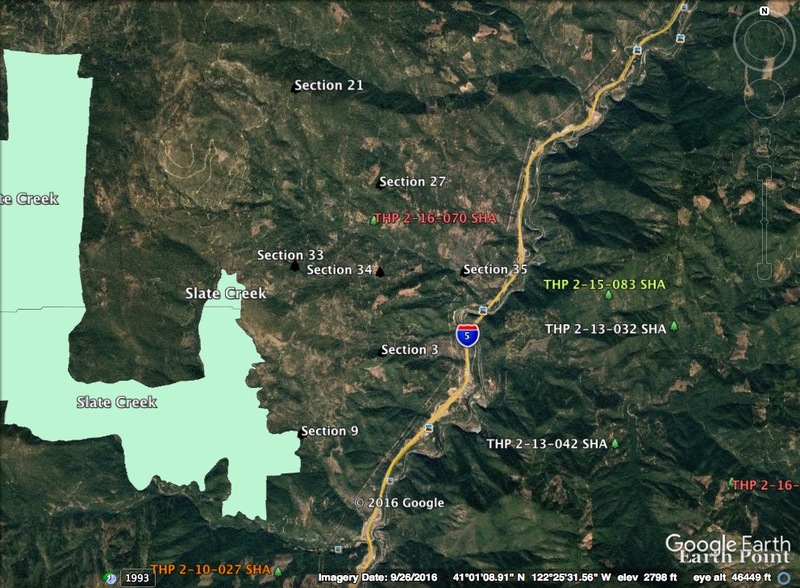 This THP is a mile east of Dunsmuir, CA and about 6 miles SE of Mt. 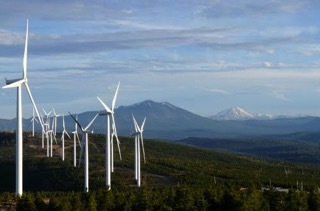 Shasta at an elevation of 2,880 to 4,480 feet. 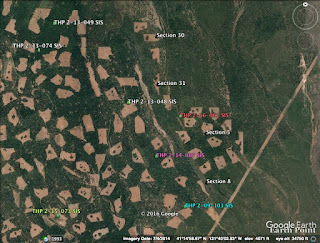 Roseburg Resources Company is planning a clearcut tractor and cable logging operation in Douglas fir, ponderosa pine, sugar pine, white fir and incense cedar forests. The THP area drains into the Sacramento River above Shasta Lake. Roseburg Resources Company is planning to use ground based equipment in areas designated for cable logging, and re-construct 2 segments of road on slopes over 65% within 100 feet of a watercourse. They also want to use segments of existing roads inside watercourse areas in units 1712, 1714, 2014 and 3003. There is an osprey nest 3,000 feet NE of unit 3301 in section 24, and a Pacific Tailed Frog was reported in Soda Creek near unit 1713. Foothill yellow legged frogs were also spotted in Soda Creek 2.25 miles downstream from unit 3002 near the Sacramento River. 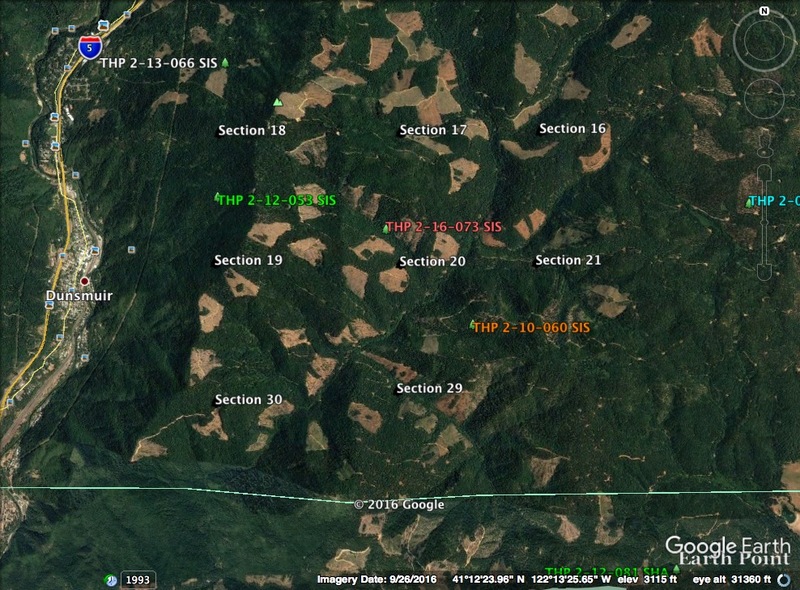 Green Diamond Resource Company to clearcut log adjacent to the CA/OR border. 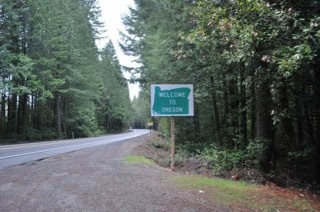 This THP is about 7.5 miles south of O Brien, Oregon and adjacent to the CA/OR border at an elevation of 1,800 to 4,880 feet. 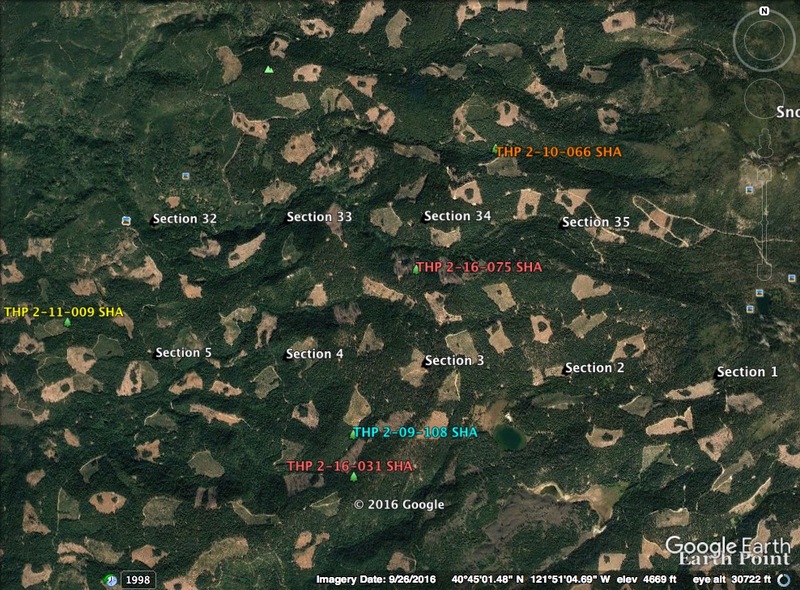 Green Diamond Resource Company is planning a mostly clearcut tractor and cable logging operation on steep slopes in Douglas fir, sugar pine, and Port Orford cedar forests. The THP area drains into the West Fork of the Illinois River in Oregon which is listed as an impaired watershed for sediment, PH and temperature. There are steep road segments between 15% grade and 20% grade for 200 feet to 500 feet in units C, E, F and G, and steep road segments on slopes over 65% within 100 feet of a watercourse in units B, C, D and E. Ground based equipment is proposed for use in areas designated for cable logging, and a landing is proposed for use inside a watercourse area in unit B. Over 11,312 feet of seasonal roads and 6,263 feet of temporary roads will be built inside the THP area. 14 road drainage sites are proposed for work including rocking, dip construction, ditch cleaning, culvert repair/replacement and restoration of washed out crossings. 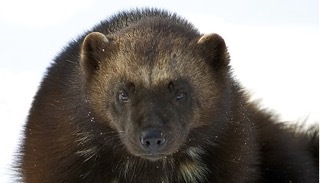 Marten was detected inside unit G, within 100 feet of unit D, and within 1.25 miles of units A, B, C, E, and F, and ruffed grouse has been spotted inside units F and G. There are 3 spotted owl nesting territories within 1.3 miles of the THP area. 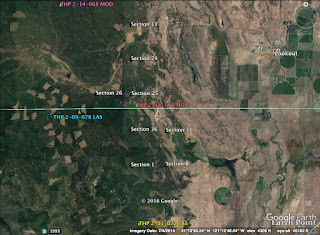 This THP is about 24 miles east of McCloud, CA (Mt Shasta area) and about 3 miles NE of Pondosa, CA at an elevation of 3,800 to 4,300 feet. 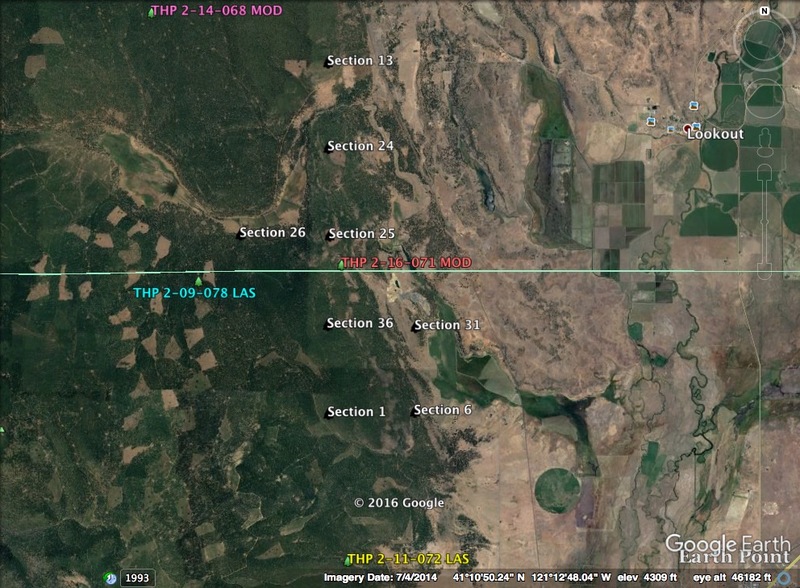 Roseburg Resources Company is planning a tractor based logging operation in ponderosa pine, Douglas fir, white fir, incense cedar, lodgepole pine and sugar pine forests. The THP area flows into Bear Creek above Lake Britton and eventually into the Pit River which is listed as an impaired watershed for nutrients, dissolved oxygen and temperature. A bald eagle was reported 2 miles SW of the THP area, and there is an active willow flycatcher population at the Bear Creek Bridge which is outside of the THP area. Long haired star tulip was found in sections 6, 30, 31 and 32. 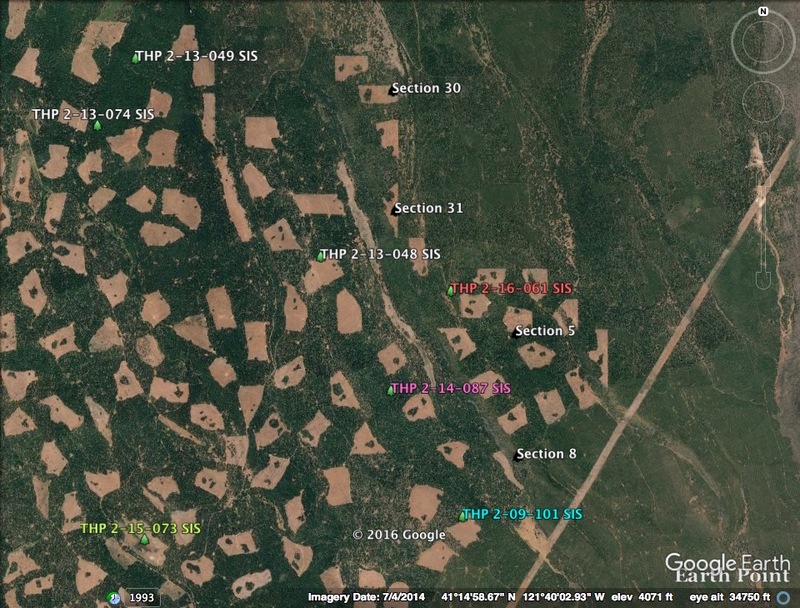 Sierra Pacific Industries to clearcut log in the Sacramento Canyon north of Redding, CA. 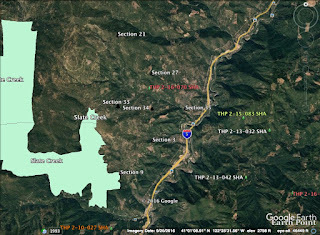 This THP is about 28 miles north of Redding, CA in the Sacramento Canyon and about 8 miles north of the town of Lakehead and Shasta Lake at an elevation of 1,600 to 5,200 feet. Sierra Pacific Industries is planning a mostly clearcut tractor and cable logging operation on steep and unstable slopes in white fir, Douglas fir, ponderosa pine, sugar pine, incense cedar and port orford cedar forests. Unit 9A has an unstable area below the last existing skid trail outside of the unit, units 3A and 9C have unstable areas associated with watercourse erosion, and unit 3D has an existing road cut bank failure and watercourse erosion. Sections 9 and 33 are adjacent to the Slate Creek roadless area. SPI is planning to use ground based equipment in areas designated for cable logging inside units 3C, 3D, 9B, 21B, 27A, 27D, 35E and 35F, and re-use 2 existing skid road crossings inside watercourse area within units 35A and 35D. They also want to build temporary roads under 500 feet without flagging and use temporary roads and landings during the winter period. Tractor units 3A, 9A, 27E and 35D have areas in which slopes exceed 50% that lead without flattening before reaching a watercourse. 13 road drainage sites are planned for work including rocking, dip construction, ditch cleaning and culvert repair/replacement. An osprey nest is located on the east side of the Sacramento River near I-5 (section 15), pacific fisher sightings were reported in sections 2, 13, 16 and 17, and a bald eagle nest is located 1.25 miles from the THP area in the Boulder Creek Watershed (section 16). Several sightings of western pond turtles were reported in the Boulder Creek Watershed over a mile from the THP area in sections 18 and 24, and multiple occurrences of tailed frogs were reported in the Boulder Creek, Shotgun and Little Slate watersheds in sections 14, 24, 27 and 28. Foothill yellow legged frogs were reported in sections 6, 9, 14, 18, 21, 24, 33, 34, and 35. 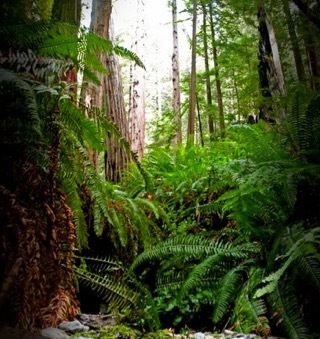 This THP is about 6 miles NE of Trinidad, CA and just SW of Redwood National Park at an elevation of 800 to 1,400 feet. 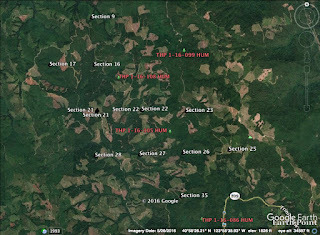 Green Diamond Resource Company is planning a mostly clearcut feller buncher and shovel logging operation in redwood, Douglas fir, grand fir, western hemlock and Sitka spruce forests. There are 2 osprey nests including an osprey nest within .25 mi of the LP Mill Road, and an osprey nest within .25 mi of the BL2000 Road. 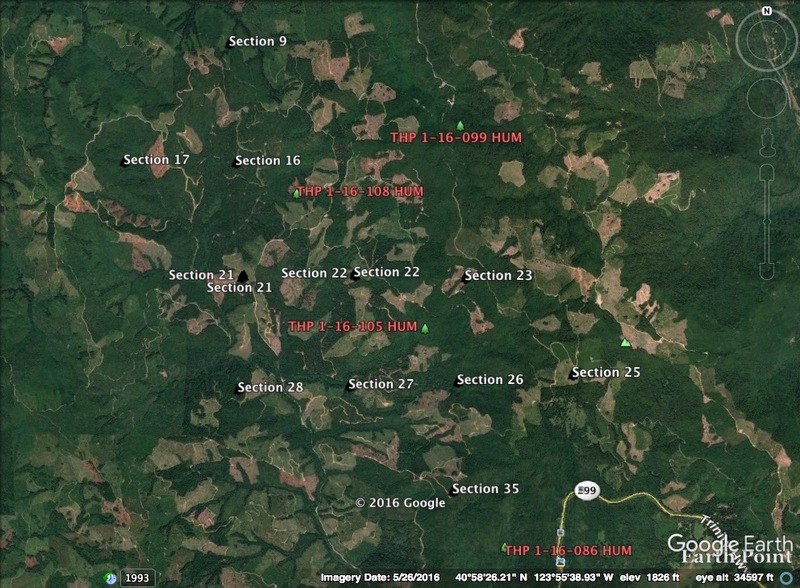 Potential marbled murrelet habitat exists on Harry Merlo State Park lands within .25 miles of the LP Mill road. A Northern Red Legged frog was spotted in unit D in 1999, and a newly colonized great blue heron rockery is located .22 miles east of the BL2000 Road. Running pine was found in units B and D. There are 5 spotted owl nesting territories within 1.3 miles of the THP area. Green Diamond Resource Company to clearcut log amongst ancient redwoods up to 7 feet wide east of Trinidad, CA. 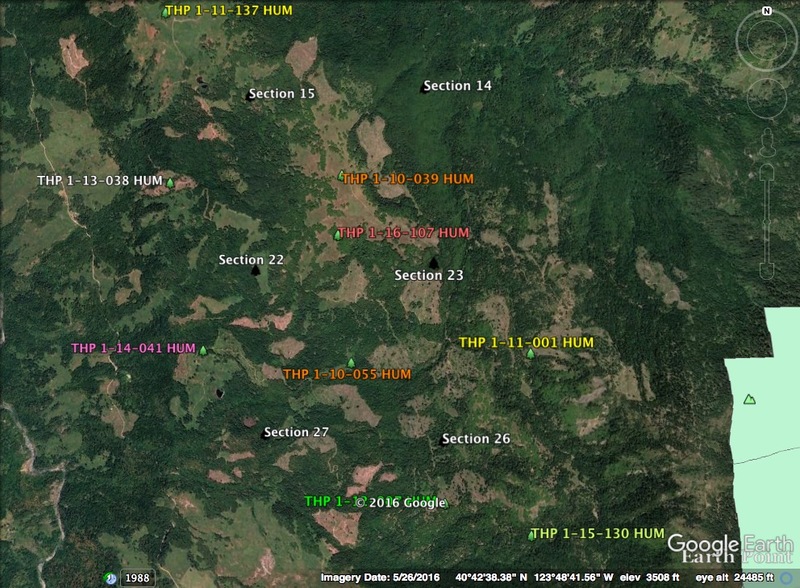 This THP is about 4 miles NE of Trinidad, CA and about 15 miles NE of Arcata, CA at an elevation of 440 to 1,680 feet. 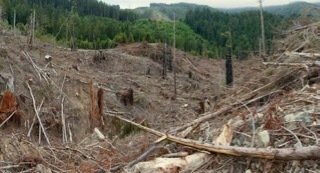 Green Diamond Resource Company is panning a mostly clearcut tractor and cable logging operation on steep and unstable slopes in redwood, Douglas fir, Sitka spruce and western hemlock forests. There are 4 shallow rapid landslides including steep streamside slopes in units B, C and E. Seven large redwood trees ranging in size from 48" to 60" dbh with hollows will be retained in unit E as Townsend's Big Eared Bat habitat trees. Marbled murrelet habitat exists within .25 miles of the LP Mill Road on Harry Merlo State Park lands, and in the Clear Creek marbled murrelet stand within .25 miles of the BL2000 Road. There are 5 osprey nests including an osprey nest within .25 mi of unit A, an osprey nest within.25 mi of the LP Mill Road, an osprey nest within .25 mi of the BL2260 Road, and 2 osprey nests within .25 mi of the BL2000 Road. A sharp shinned hawk was reported 1 mile NW of unit B, and a newly colonized great blue heron rockery is located .22 miles east of the BL2000 Road. There are 10 spotted owl nesting territories within 1.3 miles of the THP area, including nesting territories within .25 mi of unit E, and .5 mi of unit C.